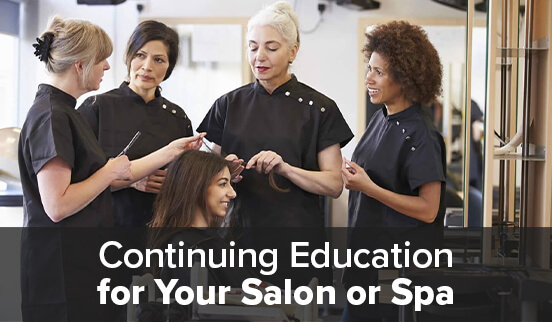 One significant aspect of salon or spa operation is continuing education. To stay relevant and to keep yourself and your staff up on current trends, techniques, and processes, it’s vital to implement a policy that supports advanced learning. And that education needs to available at some to level to everyone from reception and management to every service provider and assistant. If your salon or spa is located near New York, Chicago, Los Angeles or Orlando, the larger industry trade shows come to town once a year. These sizeable venues offer a multitude of educational opportunities and are the perfect time to get your staff involved. Whether they just walk the tradeshow floor to see what’s new or watch live demos or sign up for any number of classes, your team will find these events to be both exciting and inspiring. Everyone will come back with useful knowledge that can be applied to clients or everyday business operation. There are also distributor shows throughout the country that offer more specialized exhibits and education programs. In addition, many manufacturers have their own shows, academies, and in-salon programs. In some cases, distributors and manufacturers even have order minimums and rewards programs so that you can cash in points to use for their academy or other training. Also, if your facility is large enough, consider hosting educational events. Distributors and manufacturers are always looking for a centralized location to hold local classes for a multitude of salons or spas. Just chat with your sales representative to learn what might be available. If your salon or spa does not have access to a manufacturer or distributor incentive programs, nothing is stopping you from starting your own. Set up a system so your staff can accumulate points based on retail and service sales that they can cash in for the education of their choice. It’s a great morale booster and helps your bottom line at the same time. Regardless of how to make continuing education a priority in your salon or spa, set an example for others by staying relevant yourself. It’s a significant investment in yourself and your team. After all, if you’re done learning, you’re done growing! Awesome Post! Education is the key to any salons success! Right?! Always keep learning. Thank you for your comment.